Kids fashion in today's world is taken much more seriously than in years gone by. Kids today are much more inquisitive, intellectual and scientific. As a result of the modern kid being much more self and fashion conscious, kids fashion has taken off in to a new era as kids are more up to date with modern fashion trends. 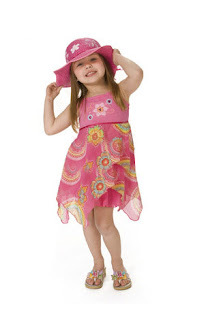 Make your girl wear cool summer dresses in funky prints and colours like this Pink And White Frock. She can team up nice printed t-shirts with shorts or Capri's. A new favourite are the leggings that are Capri length and add a stylish factor to a dress or a long t-shirt worn over it. You can keep the accessories simple with a smart Baby Hat. Jewellery should be minimalist, too; a thin Beads Necklace, a Ear ring and a charm bracelet and Girls Fancy Belly will do wonders. Your child can achieve a girly and pretty look with a fashion bag for kids, only the more flowy dresses and pretty prints will have to be teamed up with matching accessories and she will be all set to wow everyone's hearts. Very much true ! Kids today are also quite aware of the fashion trend & are wanting to try new things. Well you might want to visit coupons109.com. They have got some really good offers & deals on kid`s apparel, fashion accessories & more stuffs.